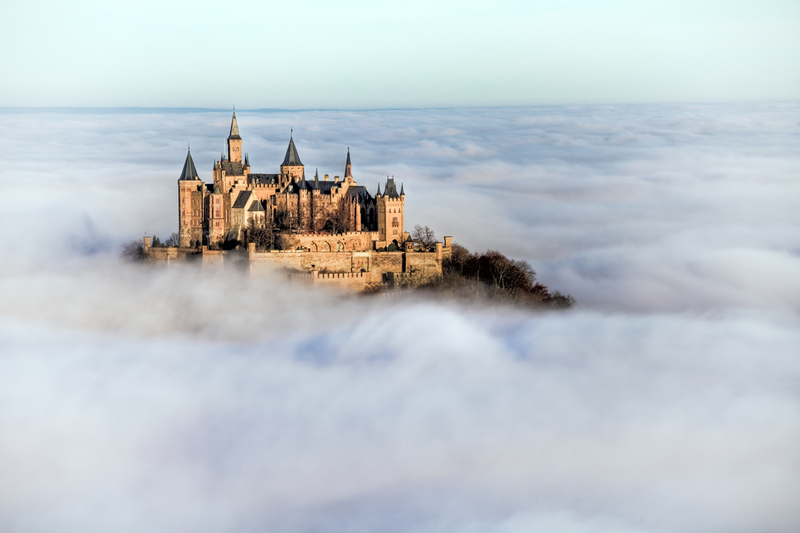 Germany has about 25,000 castles, so it’s not so difficult to find one. What is harder, is finding one that has something genuinely interesting to look at and also someone on hand to explain what everything is. 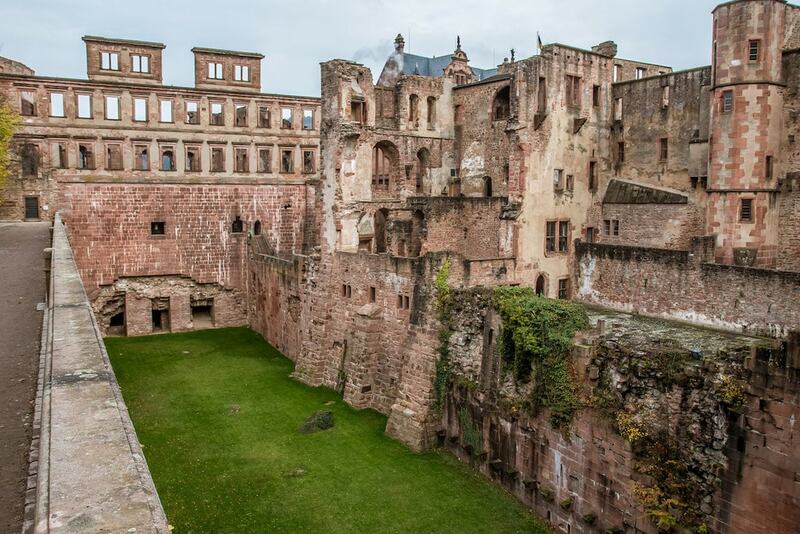 Here are our nine best picks for castle tours in Germany. Always at the top of every list of castles to see in Germany, Neuschwanstein is packed full of tourists nearly all the time. Still, it’s so iconic, a visit in the off-season is still worth it. Neuschwanstein can only be visited by guided tour, which must be booked for a specific time at least 48 hours before you arrive. If you are late collecting your tickets or showing up for the tour, your spot may be forfeited. Adult tickets are €13 each and children 18 or under attending with a paying adult are free. 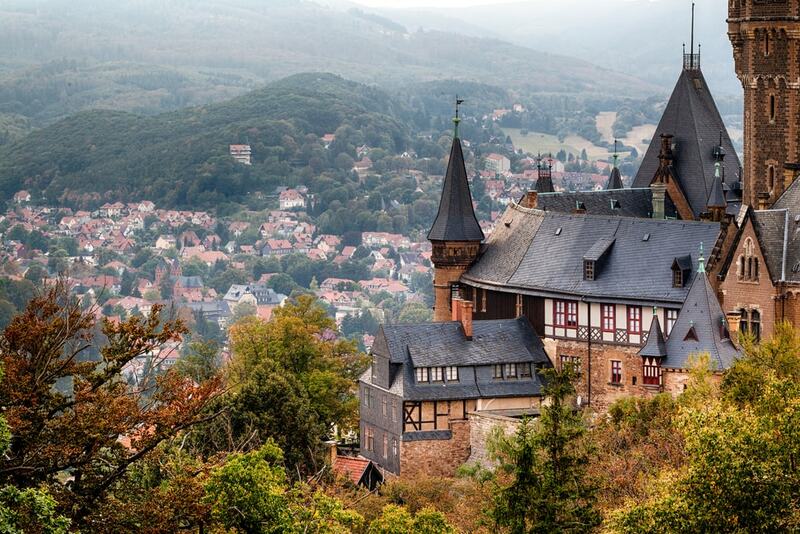 Originally a 12th century hunting lodge for the local assortment of princes, dukes and noblemen, the Wernigerode Castle was a fortress in the Middle Ages before being extended in the 19th century. The red-brick style is typical of northern Germany. Two guided tours show the insides off to great effect. The best part about this castle? You can reach it by steam train. A guided tour in English is €9. Costume, attic, and flashlight tours are also available for €12, but must be reserved ahead of time. 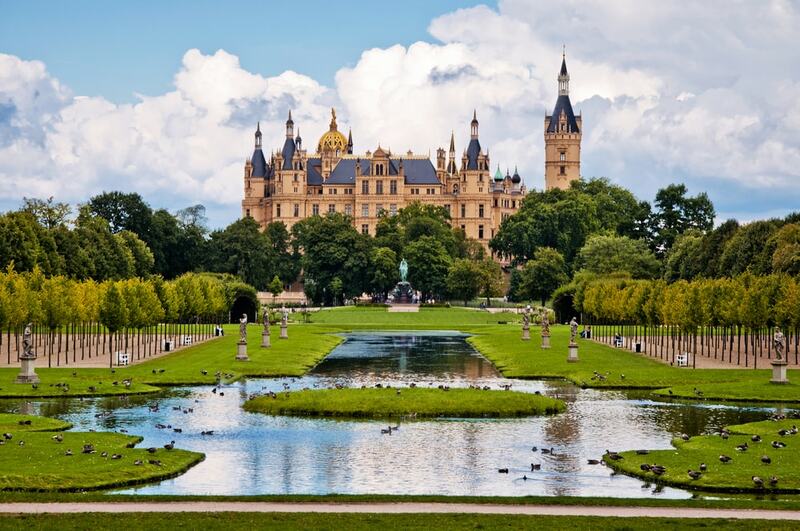 First things first: Schwerin Castle is on an island and that alone makes it 13 percent cooler than any of the other 25,000 castles in Germany. Finished in 1857, Schwerin is about an hour from Hamburg or two hours from Berlin, and is still used as the state seat of parliament. Guided tours give the lowdown about the building, but also the ghost Petermännchen and the real story of Buttocks Parade. Guided tours cost €3 and run twice a day from April to October. Enquire ahead of time about a tour in English. The House of Hohenzollern was the last royal house in power before the monarchy was abolished completely after the First Wold War. The castle itself is still privately owned, but it is open to the public. The general tour costs €12 and lasts 45 minutes. English tours are offered once day during the summer months and Saturday and Sunday afternoons during the rest of the year. Though the castle was first built in the 13th century, its appearance is thanks largely to the castle craze that swept the nation in the late 19th century. Before that, the once-imposing edifice lay in ruins due to a lightning-caused fire in 1764. Some parts have been restored, but many sections have been left too long to do anything about. The standard tour is available in English several times a day. Special costume tours are also available. Reserve ahead, particularly if you need the tour in a language other than German. 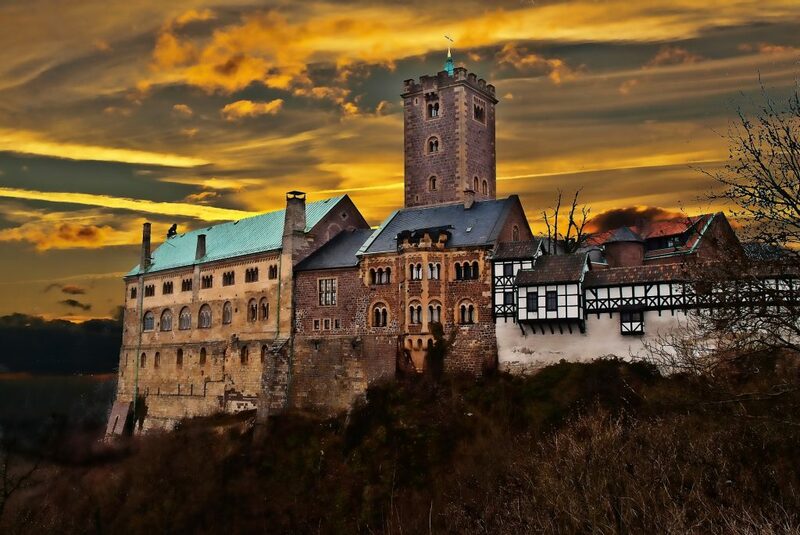 This Medieval castle became famous for offering refuge to Martin Luther after Pope Leo X excommunicated him. While there, Luther translated the New Testament from Ancient Greek to German, creating the first vernacular text. Like many old castles it fell into disrepair over the years only to be restored in the 19th century as part of the Romantic love affair with all things old and ruined. Guided tours in English are available each day at 1:30pm and cost €10. Germany’s best example of a Medieval castle is unique in that the same family has owned it for more than 850 years. They’ve not had an easy time of it, but being situated atop a 70-metre (230-foot) rock does help keep intruders at bay. Immerse yourself in the world of knights, damsels and distress. Entrance with a guided tour costs €10 per adult. English tours are available, but you need to write ahead of time to reserve your place. 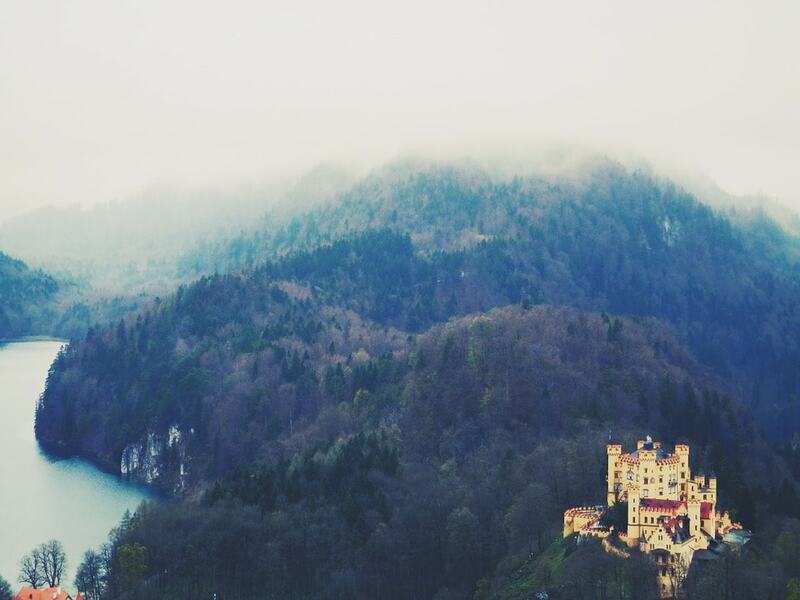 The neighbour to Neuschwanstein, Hohenschwangau was the summer home of King Ludwig II and his residence before Neuschwanstein was rebuilt in the 19th century. 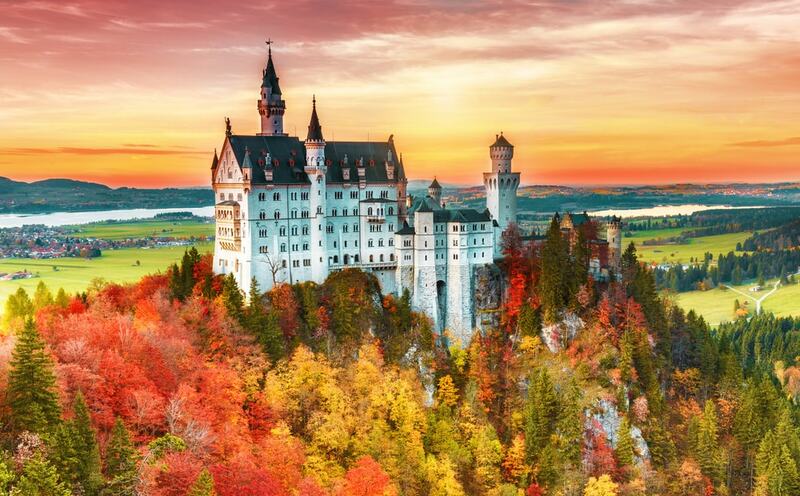 Since this is one of the most popular tourist sites in all of Germany, tickets must be booked at least two days in advance and are often sold out in the summer. All tours are guided and available in English. 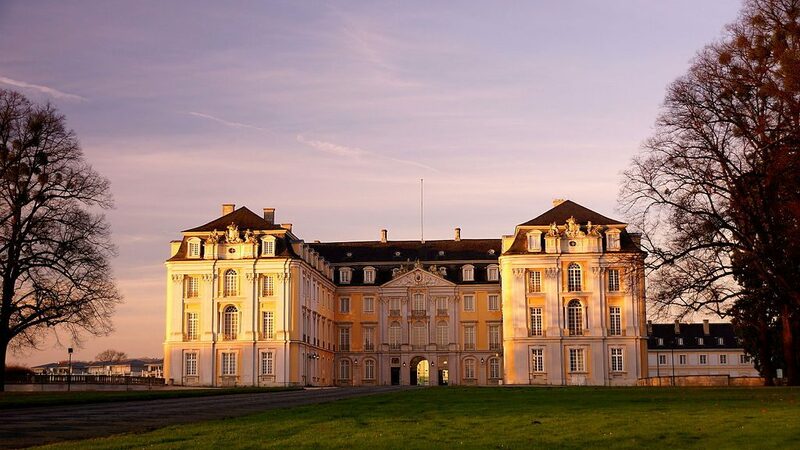 A UNESCO World Heritage Site since 1984, Schloss Augustusburg is a gem just 30 minutes by train from Cologne and Bonn. Originally the residence of the Archbishop-Elector of Cologne, the palace is publicly owned and one of the rare examples of Neo-Classical architecture in the area. The tromp l’œil in the staircase alone is worth a visit. Tours are in German, but if there are enough English speakers in the group, the guide will usually switch. The entrance fee is €8.50 and includes the tour.